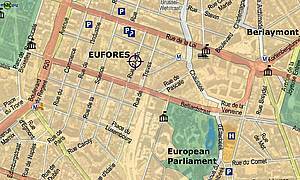 You find the EUFORES Secretariat in Brussels - in the heart of Europe, close to the European Commission's Berlaymont and to the European Parliament. Offices are located in the Renewable Energy House. The Renewable Energy House opened its new offices in 2006. The house runs on 100% renewable energy supply for heating, cooling & electricity in a monument-protected building. A broad spectrum of organizations working on renewable energy are located there under one roof.